Interested in extreme sports? Catch some sick air and combo as many tricks as you can for big points with our innovative new stunt system. Learn to back flip while tricking for extra point multipliers. 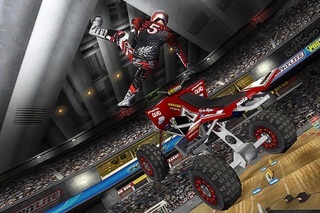 See how far we’ve pushed the graphics envelope as you ride the new outdoor Nationals tracks. Tear up and down huge mountains with beautiful views of the horizon. 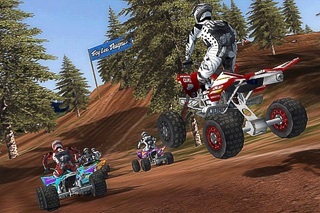 Experience the rhythm-based style of racing we made famous with classic games like Motocross Madness and ATV Offroad Fury. 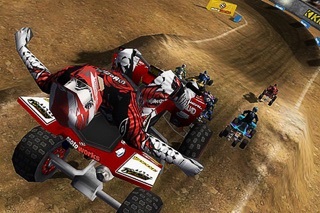 The all-new league system guides you through an ATV career where you can become the champion. The all-new achievement system challenges you to unlock 100% of the skill-based goals in the game. Compare your trophies with your friends online. See how you stack up against the competition in your quest to be the best on wheels. Sign up for a free 2XL Live account and all your game statistics will be viewable at live.2xlgames.com. * Bluetooth is not currently supported. 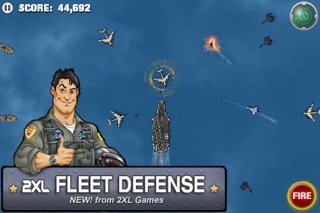 Also available from 2XL: 2XL Fleet Defense. Yes, this is the game you've been waiting for. A lot of tracks, including free-roaming levels where you get points for stunts; gorgeous design; great physics. This game is just so much fun. It all looks amazing and very realistic - it's just magnificent when all 8 racers jump together, and you can't help but laugh when one of those jumps goes horribly wrong and the guy plunges to what can only be described as near death. And career mode is very challenging. Don't mistake this for a complaint, but if the developers are listening, there is one little thing: sometimes when u get tangled with one of those blocks or when ur facing a tree or wall from very close, it's hard to get unstuck. but make no mistake about it: this does not affect the amazing gameplay. This game is just so much fun, I can only imagine having friends who owned ipod touches so we could play it together. i seriously believe it'd be as good as mario kart 64. The app is pretty much flawless but there are a few things that I think could be different. First of all, I know there are a lot of levels, but I would like to see more in the free ride area, mostly. Also concerning the free riding I would like there to be free ride option when you are hosting a game. 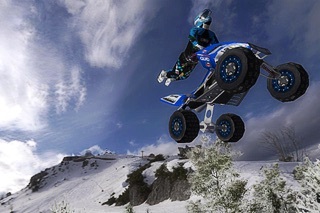 Second, there could be a career mode in which you unlock more gear and ATV’s, may also suggest to the developers advantage in app purchases. Lastly, I would like to be able to listen to my music on my iPod while I’m playing so I would like that to be somewhere in the settings. But now to praise the app, the graphics a mind blowing I was amazed at how crisp the graphics are and how smooth the ride is. The tilt controls are very well done, not to touchy like most other games, and the variety of tricks is amazing and really kept me playing, and for .99 cents that’s a bargain. The Very Best I have played/seen/bought yet!!! This is a great game and can see the playability extended with wifi multiplayer. The graphics are great, the physics are great (for an ATV), and the sound is ok. For me the hard difficulty is not hard enough and the tracks are not technical enough. I do enjoy the game despite this however. Personally I like the movement and physics of the motocross bikes in 2XL Supercross better. I'd like to see more technical tracks for both games via an in-app purchase or free upgrade. On mine there is a problem with the engine sound cutting out after extended play. This can easily be fixed with an update though. Overall def the best ATV game available by far. I'm MaverickC177 on the online leader boards, check it out. Awesome - give us retina and more tracks please! I love this app, I have owned it for a while and very much enjoy the different tracks and race modes! Getting some new content and tracks would be nicer than "compatibility" and "bug/crash" updates. Also, seeing this game with retina support would be some definite eye candy, please consider the updates! Overall an awesome ATV game...the best! Brings back memories or racing my dad back in the day and now I can race him online. I just really wish the would change where the brake is because it's to easy to hit it with your thumb.